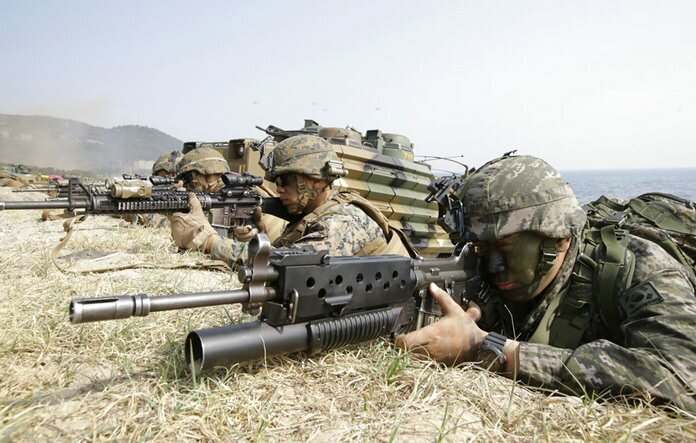 SEOUL, South Korea (AP) — America’s annual joint military exercises with South Korea always frustrate North Korea. The war games set to begin Monday may hold more potential to provoke than ever, given President Donald Trump’s “fire and fury” threats and Pyongyang’s as-yet-unpursued plan to launch missiles close to Guam. The Ulchi Freedom Guardian drills will be the first joint military exercise between the allies since North Korea successfully flight-tested two intercontinental ballistic missiles in July and threatened to bracket Guam with intermediate range ballistic missile fire in August. Despite some calls to postpone or drastically modify drills to ease the hostility on the Korean Peninsula, U.S. and South Korean military officials say that the long-scheduled exercises will go ahead as planned. The drills, which began in the 1970s and involved 25,000 American and 50,000 South Korean soldiers last year, consist mainly of computer simulations aimed at honing joint-decision making and planning and improving command operations. The United States and South Korea also hold larger war games in the spring, called Key Resolve and Foal Eagle, which involve live-fire exercises and training with tanks, aircraft and warships. There’s media speculation that the allies might try to keep this year’s drills low-key by not dispatching long-range bombers and other U.S. strategic assets to the region. But that possibility worries some, who say it would send the wrong message to both North Korea and the South, where there are fears that the North’s advancing nuclear capabilities may eventually undermine a decades-long alliance with the United States. “If anything, the joint exercises must be strengthened,” Cheon Seongwhun, who served as a national security adviser to former conservative South Korean President Park Geun-hye, said in an interview. Impoverished North Korea hates the drills in part because it must frequently respond with its own expensive displays of military might. During last year’s drills, the North successfully test-fired for the first time a submarine-launched ballistic missile ruler Kim Jong Un then praised as the “success of all successes.” Shortly after the drills, the North carried out its fifth and biggest nuclear test, which it claimed was of a “standardized” warhead that could fit on a variety of its rockets. During this year’s war games in March, North Korea launched four extended-range Scud missiles into the sea in what it described as a rehearsal for striking U.S. military bases in Japan. It’s almost certain that this year’s drills will trigger some kind of reaction from North Korea. The question is how strong it will be. Some experts say North Korea is mainly focused on the bigger picture of testing its bargaining power against the United States with its new long-range missiles and likely has no interest in letting things get too tense during the drills. If this is right, expect the usual propaganda belligerence in state media or low-level provocations like artillery and short-range missile drills. “North Korea has already flight-tested ICBMs twice this year and will probably take a wait-and-see approach to assess the impact of stronger pressure from the United States and China and maybe even seek an opportunity for talks, rather than quickly move forward with another test,” said Moon Seong Mook, a former South Korean military official and current senior analyst for the Seoul-based Korea Research Institute for National Strategy. But the North might use the drills as an excuse to conduct another ICBM test or maybe even act on its threat to lob missiles into the waters near Guam. “North Korea is probably looking at all the cards it has to maximize pressure against the United States, and the drills provide a good opportunity to do it,” Cheon said. There are calls in both the United States and South Korea for the allies to pause or downsize the joint military exercises to reduce strain and potentially persuade North Korea into talks to freeze its nuclear program. David Wright, a U.S. analyst from the Union of Concerned Scientists, said in an emailed statement that the United States should “postpone or significantly restructure” the exercises to reduce the risk of military confrontation. “Smart military planning means ensuring that exercises do not enflame an already tense situation,” Wright said. South Korea’s Kyunghyang Shinmun newspaper said in an Aug. 11 editorial that the allies could gain a bargaining chip in efforts to persuade the North into meaningful nuclear talks by halting or scaling down the joint drills. “The U.S.-South Korean drills aren’t a sacred realm,” the newspaper said, referring to the time that Washington and Seoul agreed to cancel their large-scale Team Spirit drills in the early 1990s to induce the North to join denuclearization talks. These arguments might not win over South Korean conservatives whose main fear is that a fully functional ICBM in Pyongyang would eventually force the United States to consider a peace treaty with the North and also the removal of the tens of thousands of American soldiers stationed in South Korea. While expressing a desire to reach out to the North, South Korea’s liberal President Moon Jae-in has also ordered his military officials to schedule talks with the United States to increase the warhead limits on South Korean missiles, and his prime minister said recently that the country should also consider acquiring nuclear-powered submarines to better cope with North Korean threats. Some conservatives want more strength, however, and are calling for the United States to bring back the tactical nuclear weapons that were withdrawn from the South in the 1990s.